Every child is often asked “what do you do?”…what sports do you play?, what instruments do you play?, what is your “thing”? I know of several PRECIOUS children that don’t really have a “thing”. BUT, they are tender, meek, gentle, kind, humble and truly understand “love”. It is so important that we point out a child’s spiritual gifts and allow them opportunities to use those gifts of character to glorify God….as it is these gifts above all others that will truly change the world. When MHA students were introduced to our change drive for our New Day charity event, one of our sweet students quickly emptied his pockets to give to the children at New Day. He gave humbly and without second thought; true, genuine giving. Pierson is filled with spiritual gifts. He has a heart full of love and compassion for others…and he is acting on it (love as a verb). He is a bright young child who intuitively feels for those with special needs. We have a little boy at MHA with Autism and limited language to express his feelings. One stormy afternoon, Pierson sat close to this little boy at lunch as he knew the storm made him feel anxious. 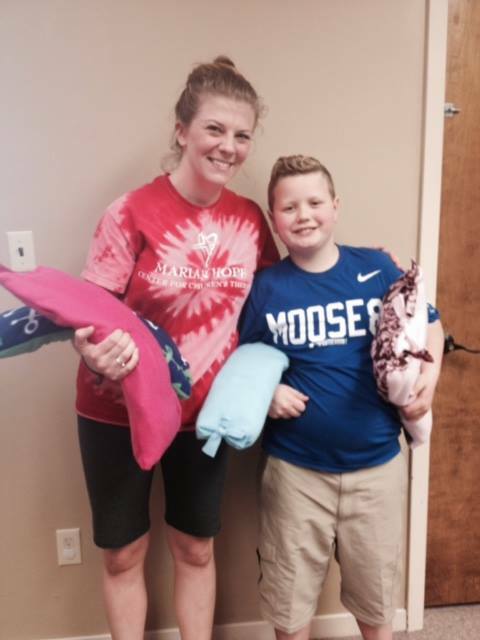 He now has created his own website and is making lap blankets for children with sensory and proprioceptive needs. He has already donated several to Marian Hope Center. You can visit his website or follow him on Twitter @PierScience. Pierson is a blessing to MHA and how he chooses to use his God-given gifts inspires others. He has a beautiful soul!